It’s Day 5 of our April Challenge and we are focused on eating REAL food, not highly processed foods. Many modern foods are processed to some degree in an attempt to improve shelf life, flavor, appearance (and hence to improve sales) and even to improve nutritional value. 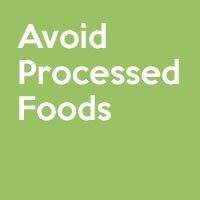 In some instances processing may remove or destroy beneficial food components. So how can a consumer increase his or her consumption of unprocessed or minimally processed foods? Here are 10 helpful tips to help you avoid processed food this month. Hot cereals and certain other products are often available in ‘regular’ or ‘old fashioned’ form vs ‘instant’ or ‘quick’ form. Oatmeal and grits are examples. The ‘quick’ or ‘instant’ products have often been precooked. Stick with the ‘regular’ or ‘old’ fashioned options. Bread, cereal, pasta and other grain products may have had the bran and other portions of the seed removed or partly removed. Look for ‘whole grain’ in the list of ingredients, and consider purchasing brown rice instead of white (which has had the bran removed). Pearled barley has had some of its bran removed, but still has quite a significant amount of fiber. Oils are often hydrogenated or partially hydrogenated. Reading the labels is a good way to make sure of whether the product has been so treated. Some cooking oils are produced by ‘cold pressing.’ This indicates that they have not been extracted by solvents or exposed to high heat. Many canned vegetables and fruits have been treated at high heat to make them shelf stable at room temperature. Fresh or frozen produce has been exposed to lesser or no heat. Jams and preserves can be considered less processed than jellies. Jellies have little of the original fruit pulp remaining in them, as opposed to jams and preserves. Again, fresh fruits are best. Cured meats (such as ham, bacon and sausages), usually have nitrates added. There is an increasing selection of these products nowadays which do not have nitrates added. Reading the ingredients is the way to tell. Turbinado, or raw, sugar contains some natural substances which are largely removed from refined sugar. You can also use agave nectar (low GI) or honey instead of white sugar or corn syrup. Using fresh fruit is another great way to add sweetness. Farm raised salmon often have artificial coloring added to their diet to make their flesh the expected orange color. Wild caught salmon do not have this issue, and also generally have a higher level of omega-3 fatty acids in their flesh. Some pickles are made with alum, and aluminum compound. Calcium chloride is also a common pickle ingredient. Calcium chloride is probably the less objectionable of the two, as its components are nutrients or components of nutrients. This is something you have to do your own research on based on what you like to eat. Continued reading, including simply reading ingredient labels, is an excellent way to learn more about the degree of processing in our food choices.